The Lower Red Lion in St Albans is a traditional pub dating back to the 17th century located halfway down Fishpool Street, about five minutes walk from the High Street. It is renowned for its fantastic selection of real ales and as it is a free house this selection is varied and ever changing. It advertises up to eight real ales but I'm not sure that as many as that were available when we visited. Our review team arrived at around 10pm on a Wednesday evening in the middle of the weekly quiz and found the pub busy with a friendly welcoming atmosphere. 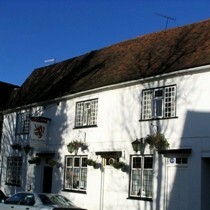 The Lower Red Lion has two distinctive rooms both for drinking (as opposed to dining), with the one on the right probably being slightly larger and more comfortable. Although accomodation is available I have seen no signs that there is any food available for casual drinkers. This is a nice homely, cosy pub, especially in the winter when the real fires are going, and with a fine selection of ales it is well worth the walk from the city centre.